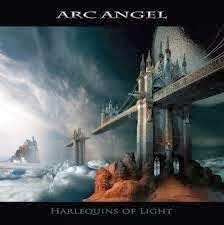 Following a chance meeting with Paul on a Welsh mountain top; cold and wet but certainly having a good time at the Steelhouse Festival , I am pleased to submit my first album review - Arc Angel's Harlequins of Light. The names of Jeff Cannata and Arc Angel are both synonymous and legendary within AOR circles and Frontiers must be delighted to have them on their roster of artists. Whilst being fully aware of both names, I was not overly familiar with their work and so was able to listen to the Harlequins of Light album with open ears and no preconceptions. Having now heard it 2 or 3 times I can say this : Jeff and Arc Angel have produced an aural banquet, but have still left room for improvement. Regardless of this minor quibble - and who is to say that JC isn't right - the whole album has been truly beautifully produced, with a great guitar sound, magical keyboard flourishes on As Far as the Eye Can See amongst other tracks, and overall we are given a sumptuous AOR soundscape. The band Jeff has surrounded himself with can truly play, but as expected he burdens himself with drum, bass, keys, guitars and all of the vocals, which makes the album's all the more remarkable. One can hear musical nods to other great bands within the pomp/melodic rock sphere - particularly the mighty Styx - and even to the 1988 Arc Angel, with a re-recording of Fortune Teller. The album could have been even better. Jeff is a good singer, but not a great singer - and the songs could benefit from a stronger voice with a greater range - I'm thinking Danny Vaughan here. The album is also somewhat one-paced, with the pieces blending into one another rendering it difficult to distinguish one from another. This may be a deliberate attempt to make the whole album a piece in itself, but IMHO the impact is diminished. The lyrics - there's nothing truly wrong with them - but they do seem contrived. Uriah Heep do the magical, mysterious and meaningless in a more believable manner.